In this episode, we sit down with Libby Mullen to discuss how to develop coaching skills in your management. Libby breaks down the fundamentals of coaching, explains how emotional intelligence plays a role in coaching, and finally, offers her great insights into emotional intelligence. Here are a few takeaways from this week’s episode. Libby Mullen is the Learning and Development Manager with BizLibrary. Libby has over 25 years of experience in Education, Training and Business Consultation, both in the Higher Education realm and in all verticals of the Business Sector. Building positive partnerships, solving business problems creatively, and bringing out and developing the strengths in others are what makes Libby “tick.” Libby is a fervent writer, an experienced public speaker and is most passionate about demonstrating the importance of life-long learning and helping clients to create and grow learning cultures in their businesses. Hannah: and I’m Hannah Brenner. Today we’re joined by Libby Mullen to talk about coaching skills for leaders and managers. Derek: First of all, we’re so glad you could join us. Thank you for being here. Libby: Oh, I’m so happy to be here. I’m very passionate about this topic. Derek and Hannah. Derek: Oh, absolutely. That’s part of why we chose you! For our listeners, Libby is actually the learning and development manager here at BizLibrary. So one of her favorite aspects of her role is coaching our team to proactively consult with clients and ongoing strategic partnerships. Libby has over 25 years of experience in education, training, in business consultation, both in higher education realm and in all verticals of the business sector, so building positive partnerships, solving business problems creatively, and bringing out development, bringing out and developing the strengths and others are what make Libby tick. 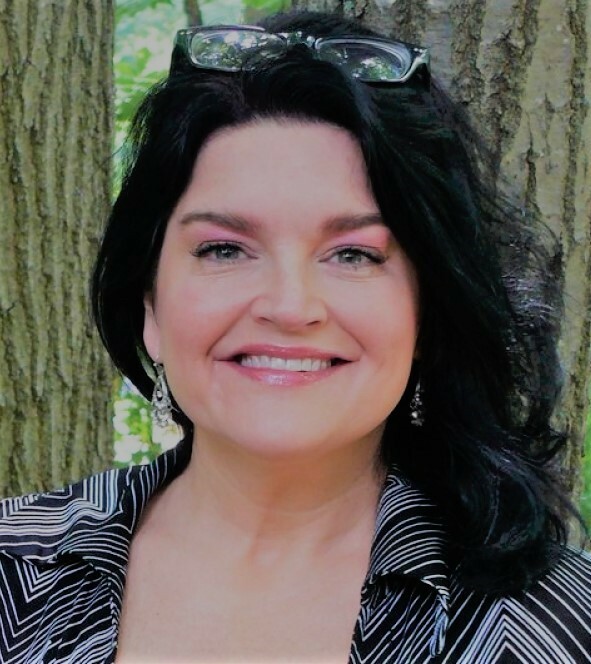 Libby is a fervent writer, an experienced public speaker, and is most passionate about demonstrating the importance of lifelong learning in helping clients to create and grow learning cultures in their businesses. So you can see why we’re so excited to have you here today. Hannah:Oh, thank you so much. Me Too. Derek: Uh, so Libby, not too recently, When was that Webinar that you presented? Libby: 01:48 I would say it was in early June, and it was On and uh, it was actually on developing the coaching skills of your managers and leaders. Derek: 02:01 Cool. So that’s actually what we’re here to talk about today and sort of follow up from there. Um, so first of All, can you just give us a brief summary of what you talked about in the webinar? I know that it was an hour long, so maybe a five to two to five minute version. Libby: 02:15 So, um, the, the webinar was a basic introduction to developing a coaching culture in your business. A coaching culture is different from the traditional performance evaluation culture where maybe you talk about performance a couple times a year in detail. This was a basic introduction to starting and planting those seeds for creating a coaching culture with continuous feedback for the purpose of improving performance continually to drive business results. Hannah: 02:54 Perfect. And one of the things, um, with your webinars, you know, a lot of questions in. So this is a big topic and a lot can be covered. And so we wanted to take today and our talk today to cover some of those questions that we didn’t get to on the webinars so that we could follow up for all of those listeners. So one of the things that came in was, um, you know, ask what the best way for managers to ask their employees for feedback. Hannah: 03:23 I think a lot of times we see that it’s easy for managers to give feedback to their employees, but going the opposite way and employees coaching up can be very difficult. So how do managers go about encouraging that behavior with their employees? Oh, Hannah, that’s a fantastic question. And really a vital part of a coaching culture. A lot of times employees might feel apprehensive or nervous about providing feedback to their managers or it might tend to be more on the positive side because they might be afraid or to bring up something that is, is might be perceived negative. So a great way to open up those channels of communication, um, is to start with some simple exercises. So one would be using what we call the start stop, continue model. So you could ask always open ended questions during coaching, but a manager could ask either in person or first in writing. Sometimes it’s easier to start getting ideas flowing and writing because it feels more comfortable, but you could say, um, what would you like me to start doing? And just get, let it open up for them to give you some feedback and then after you’ve had a conversation there you could say, what would you like me to stop doing? And lastly, what would you like me to continue doing? So that provides an excellent structure for employees to start giving feedback and the idea would be to continue to grow that so that it becomes natural and they would be able to give that feedback and ask for help. Hannah: 05:11 Definitely. And I think that structure is what’s really important because when you just asked, you know, what feedback do you have that’s too broad and that can be very overwhelming. So having that structure is very beneficial. Absolutely. New Speaker: 05:25 Following up on that question, what are some of the best practices to start coaching an employee that has had performance issues? Libby: 05:32 Okay, that’s a great question, Derek. So when you’re coaching, rather than just telling an employee and pointing things out, you start asking questions. So let’s, let’s use an example. So let’s say that an employee, I’m continuously is rude to clients on some calls or maybe the way that they’re speaking isn’t, doesn’t have a good business acumen, um, attached to it. So listening to a call together and then asking questions, open ended questions about that call. Like, so what do you think we should, what do you think you could’ve done better or what do you like about this color? What are you proud of about this call? And start getting those conversations going. If the employee is unable to identify those things and, in that self-awareness, as we’re continually trying to develop that, then you can ask some more specific questions, you know, how do you think people feel when you say this particular thing and if they’re really, you know, you can keep drilling down but still open ended questions. Giving them the opportunity to have a realization because that’s when the real learning will happen. Um, and so that, especially if it’s a performance issue, you want to get that pinpointed and then have them work on ways to, um, improve that with your guidance. Hannah: 07:06 Definitely. And so you started to touch on some of the different aspects there of emotional intelligence and I know that that became a hot topic during your webinar and a lot of questions came in around emotional intelligence. It’s such a hot topic right now. So when you are coaching somebody who maybe lacks that emotional intelligence like you were talking about, they can’t even identify these things. How do you go about helping them build on those skills to become more emotionally intelligent and more aware? Libby: 07:39 That’s an excellent question. Hannah. I want, I want to backtrack to the webinars so we can explain why that topic of emotional intelligence became a set such a hot topic during it. Um, I brought up as a statistic and kind of a study during that to explain the importance of coaching and developing emotional intelligence. And I know a lot of people had a question about that. And so really what it was saying was that the most important predictor of success in any position is not education. 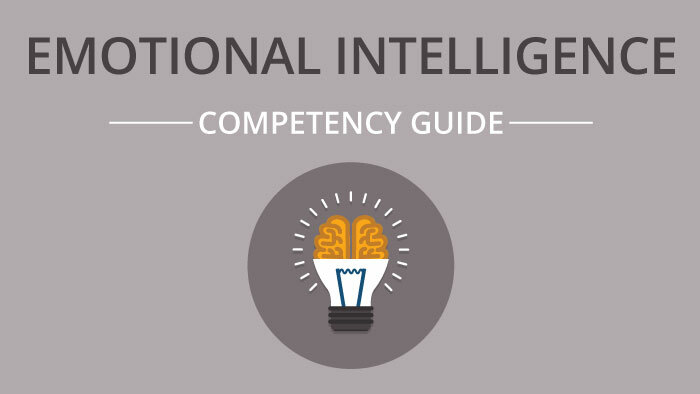 It’s not intelligence, it’s not even experience, it’s emotional intelligence. So, we can see um, and there was a specific study done by Accenture that followed 251 executives in six countries longitudinally and you know, determine that, especially with managers and leaders, emotional intelligence is the number one predictor of long-term success. So back to your specific question about coaching an employee first, kind of identifying why you believe that they lack emotional intelligence and kind of keep looking at those particular aspects of their behaviors and I’m associating some competencies with those. The first step in emotional intelligence is self-awareness and so coaching and guiding them to be self-aware by asking questions that are open ended in coaching. The point is we don’t want to just tell someone, well, you were rude on the phone, you know, you, you want to have them have the opportunity to have that realization by having a chance to listen to the call list, you know, and you designing open ended questions for them to come to that conclusion. Because sometimes people don’t know what they don’t know. And that’s the point of coaching is to increase awareness. Derek: 09:45 I know we’ll definitely get back on this subject. Um, again, the subject of emotional intelligence, but really quick, I want to ask this question because you talk about emotional intelligence being a great predictor for, for leaders and managers. This is a fantastic question. Someone asked who should be the coach when dealing with upper management or department head, so high up leaders who don’t seem to be performing at the level that may be they’re expected to at that time. Is it appropriate for HR or people in l and d to become coaches to those types of employees? Libby: 10:17 Yeah. I think it depends on the structure of your organization and kind of looking at your org chart, but when you’re talking about your c level executives, I know that’s kind of a sensitive area when there are some skills that are lacking. Definitely. Um, you know, if, if your company has an HR departments, um, if there’s been someone that um, you know, those departments tend to have kind of long tenure of employees that would be able to first approach that, um, executive with data, um, around the importance of this because of course in the end they are wanting their business to be as successful as possible and to drive their business results and meet and exceed their goals. And so coming to them with data about the importance of these things and then having those coaching conversations. Also, there are cases where you can hire an outside resource for this purpose. There are executive coaches and that might be a really good way to solve that problem because it’s not someone that necessarily directly reports to someone in the c suite. But it’s an outside resource that specialized for executive coaching. Hannah: 11:38 Definitely. And so everything that you’re talking about is a major culture shift for organizations who do not already have this coaching culture. And a lot of times people are looking for that quick fix or that simple way to help people, you know, gain emotional intelligence or become better coaches. And I know what you’re going to say to this, but the question came in, you know, do you have a simple way to help gate help leaders gain that emotional intelligence to become better coaches just like When you’re trying to establish a learning culture and an organization that, that is not a learning culture. Establishing a coaching culture is the same way in any kind of learning or change management is a process rather than events. Libby: 12:34 Um, but I think that structuring, starting to structure the way things are set up is a simple way to get started. So if we look at BizLibrary, we have a coaching culture and each week our managers meet with each of their employees for one hour for this purpose. Um, and so there is a feedback that’s going both ways and it’s a matter of restructuring how things are set up first and then getting to the meat of the things that you want to, um, to the change you want to drive. Yeah. So no quick fix then. Definitely not anything that’s really worth it in the end is, is not easy I found in, in, in life and work. Hannah: 13:42 One of the things at BizLibrary that’s a common term that we use is coachable. So you want to make sure you see behavior as you continue working with an employee, that they’re coachable. And what that means is that you are able to see behavior change occurring as you’re working on particular things. Some people, you know, face it, there are some people in life that are stubborn and they’re just going to continue to do things their own way regardless of coaching and um, but then on the flip side, you want to make sure that your managers are coached to be able to coach somebody properly. So when you’re looking at, you know, identifying those areas, um, sometimes if it’s critical, it might be important to bring in, you know, a third party, um, in, in your org charts, kind of take a look at the situation, um, and you know, kind of analyze there, but you should, if you’re coaching properly, having, asking questions for them to come to their own conclusions and making these behavior changes, you should be able to see measurable results. Um, and if someone is not coachable and they’re not performance, you know, it is not improving. It’s time to be making some difficult personnel decisions. Hannah: 15:02 Definitely. And so that starts with the hiring process and making sure you are hiring the correct people. So how can you identify maybe even during the interview, somebodies ability to be coached and also their current level of emotional intelligence to go back to that because they are hand in hand a lot of times. Libby: 15:25 Definitely. I really love this question because, you know, I agree with you. It all starts and the hiring process and the interview process. So you know, our interviews at BizLibrary, very behavioral based. We have a very strong philosophy to hire the right people and then train, no train the skills. So it is not uncommon for questions in our interviews to say something like this at BizLibrary, we hire employees who are smart, driven, curious and caring. Tell me how you demonstrate caring in your daily life. And allow them to answer and elaborate. Um, we also ask questions about a time that someone didn’t get along. Tell us about a time you didn’t get along with a manager or a coworker, but we don’t say, what did you do about it? We allow them to tell the story and then see how they handled things or what they’re doing. So by asking those behavioral questions that kind of target for what you’re looking for, you’re going to be able to unearth some things that you wouldn’t if you’re only talking about skills and experience. Derek: 16:41 I’m curious because I remember this question during my own BizLibrary interview, um, what are some good answers to tell us about a time you didn’t get along with someone at work or in life? Hannah: 16:55 So I think it’s important to, you know, tell the story and keep it factual, um, When, when you’re interviewing, um, to also show that you, if the employee or the interviewee is showing that they understand the other side of the dilemma or arguments or whatever, that they’re able to empathize and that they were able to put some wheels in motion to resolve that issue. That it just didn’t, you know, it wasn’t left unresolved, at least from their side. Um, I think that the ability to be able to see both sides and to work, you know, work through to a solution is the key here. Hannah: 17:42 Definitely. And so I actually want to pause and take a step back because we’ve been having this conversation creating a coaching culture and we forgot an important step in that is the buy in of the leaders and managers, which we talk about a lot, the importance of so before an organization tries to go to this coaching culture, how can they go about getting all of the managers who are going to be coaching a lot and asking for a lot of feedback? How do we get them on board if they’re resistant? Libby: 18:18 Great question. So since generally a manager is performance is based on the performance of their employees, Anything that a manager can do or learn to do that will improve the performance and drive the business results that they’re seeking, they’re going to be a little more open to that. I’m looking at, you know, in, in any kind of change management, it’s very important to be transparent and open about the purpose and why the change. To provide some examples or case studies of successful stories and, and to show what’s in it for them. For instance, one of the huge purposes of coaching is to create employees that are able to problem solve on their own, that are able to be innovative, that have confidence, and also are empowered. So think about this for a manager. Um, we call BizLibrary we, we call it no monkeys, like don’t just bring me your problems. Those are just monkeys like come and bring solutions. So in coaching, a manager would ask things like, well, what do you think we should do? Or what do you think you should do? What solutions have you considered, you know, so you’re training them to be able to solve these problems on their own. So if you show a manager what’s in it for you, like by the, you know, as we continue working here, it’s not going to be, oh my gosh, solve this problem for me or do this. You’re going to have a group of very empowered, um, you know, self-reliant problem-solving individuals that are confidently driving business results. and um, you know, ultimately the manager’s performance as is based on their employee’s performance. Hannah: 20:10 So once the managers are on board and they start buying into this, it’s obvious that this also takes a lot of time and so time is one of those things that we never have enough of, there’s never enough time to do everything in the day. And a lot of managers today are working managers on top of managing a team. So how do you help your managers find the time to be able to coach their employees effectively? So we’re looking at the schedule and the, the schedule, your daily activities and things, you know, would, would play a factor? Definitely. At BizLibrary, we have a dedicated hour a week as I was saying, you know, each employee with their manager and if you, as a manager that has 15 employees, that’s going to be really difficult to have a whole hour of time. Hannah: 21:08 Um, so maybe start out, you know, weekly, but for half an hour, I’m sure certainly we could carve out a half an hour to spend with each of our employees or maybe five weekly, you know, and just to get that feedback cycle started. Um, we, you have to start somewhere and what you’ll see happening as that, as you continue to coach and work with your employees, you’re going to have more time as a manager because you’re going to be dealing with a lot less problems and things that you use to deal with and because your employees are empowered to do those things and so that will even free it up more for continual development of them personally, professionally and, and in their career. Hannah: 21:51 Yeah. So spend more time now and it gives you time back later. New Speaker: 21:58 I’m part of a, one more question that we have here. Um, what about peer to peer coaching? How do we get people on board to even be coached by their peers? How do we tell peers that you can’t boss them around, but we do want to help you develop and how do we start that process because that’s a lot harder than hearing feedback or getting coaching from a manager. Libby: 22:21 Interesting. So we actually have, since we have a coaching culture library, we have a lot of peer to peer coaching going on and I think that just as the analogy I used before of establishing a learning culture that that’s going to involve some change to. But when you’re setting up a coaching culture, if you’re saying, okay, for instance, you know this employee over here is really great at excel. So anyone that needs you know, some help over here have some coaching time with them, you know, maybe with the peer to peer coaching it can be that part can be more skill based and we can look at the strengths of each individual employee that can help others. Whereas the performance issues and things can be in that coach, in that manager and employee relationship. But we can be coached about all different things and maybe as far as peers, I’m just looking at ways that we can bolster each other up with our strengths. Hannah: 23:21 Definitely. And I think that’s where the second half of this, when we say coaching skills for managers and leaders comes in because you can be a leader without being a manager. And I think one of the best ways to get that peer to peer coaching is if there is a leader, not necessarily a manager, if that person asks for feedback from their peers, it opens that in those channels that hopefully the rest of the team will start asking for that feedback and that help as well. And you know, that’s where leadership really comes to play. Absolutely. And it’s. So it’ll, it really gets the ball rolling. Once someone has an opportunity to work with appear and then they’ve been able to improve and others around them are saying like, oh my gosh, this person is so much more confident or they’re getting, you know, they’re selling so much more what, you know, whatever the particular goal is, there are going to be more open to. Because we all have great talents and gifts and resources to share with our peers. And um, you know, it’s not uncommon here for peers to coach each other. On a daily, weekly basis in different areas. New Speaker: 24:32 Thank you so much for joining. I should think that’s unfortunately all the time we have for for today, but we really appreciate you sharing your expertise with us today. Hannah: 24:38 My pleasure. It’s certainly a passion of mine and we’ll be sure to have you back. Thank you. Derek: 24:46 Thank you for joining us today. We hope you enjoyed our interview with Libby Mullen. Here are three takeaways from this week’s interview. First, coaching employees should be part of the overall organizational culture. Second, emotional intelligence is the greatest indicator of success in managers and leaders, and third, putting in the time now with your employees. Saves time later. This podcast is brought to you by BizLibrary, your online learning partner. For more information, visit us online at www.bizlibrary.com/resources. Every week we like to spotlight one of the free resources BizLibrary offers to help our listeners master the concepts and our key takeaways this week. 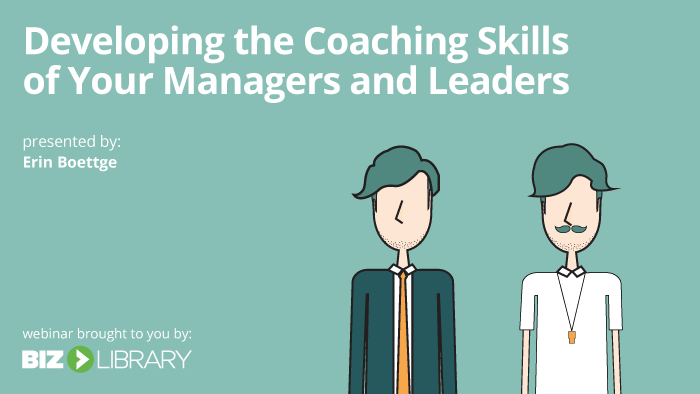 Check out our free webinar called developing the coaching skills of your managers and leaders. You can find a link to this webinar in the show notes or on the library website on the resources. Derek: 25:37 If you’d like to appear on the BizLibrary Podcasts, or suggest a topic for discussion, visit us on twitter, @BizLibrary or email us at [inaudible] dot com and don’t forget to click subscribe. Leave a rating on iTunes and share this episode with friends through social media. Thanks for listening, and until next time, I’m Derek Smith and I’m Hannah Brenner. See you next week.